Mobile devices are proving to be a massive opportunity for fintech companies to engage with a generation who spend a lot of time in-app but who don’t react well when presented with traditional financial services. In Europe, mobile-only banks such as Revolut, Monzo and Starling rode the first wave, while more focused savings and investment products have come from the likes of Moneybox, Squirrel and Chip. In the US, apps such as Robin Hood (for share trading), and Acorns (for micro-saving), have been leading the charge, and it’s from Acorns that a fascinating collision of fintech and gaming has emerged. Currently available for US users as a beta on Google Play (with iOS to follow), it’s called Blast and consists of three components: Save, Earn and Win. The first element sees users connecting their online checking (or current) bank account to their Blast saving account, which offers an interest rate of one per cent. They then set up actions that are triggered when they play mobile games, including Clash Royale and Candy Crush Saga. Counter-Strike: Global Offensive is also supported with more PC games expected to be added soon. These triggers could range from transfering money to their Blast wallet depending on how long they spend playing to more complex events such as transfering cash when they level up. “Typically, we’re seeing people setting between one to 10 cents per triggered action, so perhaps saving $1 per day,” explains Blast’s VP, business development Armin Collosi. On that fundamental level, Blast - like Acorns before it - is hoping to address the much-quoted statistic which states 40 per cent of Americans don’t have $400 in terms of emergency savings. More enticing for users, however, are the Earn and Win elements of the app. 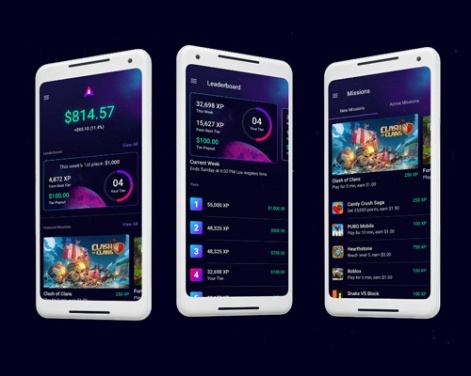 Launched with publishing partners including Zynga, Pocket Gems and Disruptor Beam, Blast acts as super-charged discovery platform for mobile games. The cash provided to users is paid for by publishers with Blast acting as a re-distributor of UA money. In this way, publishers can set in-game engagement levels in their promoted games - labelled as missions - such that players are rewarded with cash (called dividends) into the Blast wallet when achieved. Again, these missions could be anything from a fixed amount of time spend playing to gaining a specific level or completing a quest, so effectively this is a cash-for-achievement system. Of course, the cash provided to users through this engagement is paid for by publishers, with Blast effectively acting as a re-distributor of user acquisition money. The final element is Win. Again, this is a cash reward, paid out to players to top weekly tournament leaderboards. Currently the leaderboard winner gets $1,000 with second and third placed players receiving $500 and $250 respectively. Although it’s early days for the project, which was spun-out of Acorns and is headed up by Acorns’ co-founder Walter Cruttenden, the metrics are apparently good. “I can’t reveal any numbers yet, but in terms of the goals we set for saving and missions, we’ve significantly passed them,” Collosi says. So, backed with a $12 million seed investment round, including from legendary US motivational speaker Tony Robbins, Blast looks well placed to continue to scale, with support for more countries expected as banking regulations and other T&Cs are completed. Forget installs - what’s your game’s deep engagement event?